METAZEN is an online fic­tion zine that pub­lishes short fic­tion and poetry by var­i­ous authors. 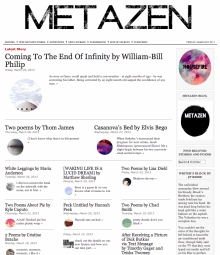 Metazen is a fly­trap for metafic­tion, exis­ten­tial­ism and absur­dism. It har­bors all kinds of filth such as neu­rotic char­ac­ters, obscure philoso­phies, love for inan­i­mate objects and quests toward enlightenment. We will accept reviews of poetry, ebooks, chaps, novels or anything else remotely related to the literary world. Be creative in your reviewing but note, we are not out to burn or scathe, but to enlighten potential readers. Do not submit anything with the slightest tinge of hate. Your reviews may come in any format so long as they possess some combination of wit, intelligence and heart. VReview Review 30 - 35,000 words. Poems should have a particular aesthetic quality that fits with under the nearly tattered umbrella of “experimental”. We like poems that challenge us to think of things in fresh ways. We like poems that fetch things from inside of us that seemed lost. We like poems with odd lilts. We like anticipal poetry. We like poems that have been accepted and then rejected from the Paris Review. Your poetry should have a subtle sexiness.